The immediate benefit of this work will be for scientists studying the brain in diseases like Alzheimer's. Prof Sestan said: "We don't yet have knowledge whether we would be able to restore normal brain function." Prof Dominic Wilkinson, a professor of medical ethics and a consultant neonatologist in Oxford, said: "Once someone has been diagnosed as 'brain dead' there is currently no way for that person to ever recover. "If, in the future, it were possible to restore the function of the brain after death, to bring back someone's mind and personality, that would, of course, have important implications for our definitions of death." 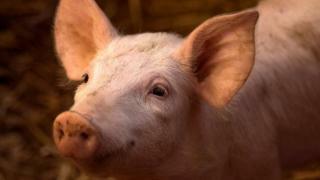 Could the pigs' brains be aware? Also, the team used drugs to suppress brain activity - would the decapitated brains have been aware if they hadn't?